Serissa get there name from to smell which is produced when the tree is pruned. There are a few varieties which have been cultivated from the single genus found in the wild. Notable is a variegated version, which we sell a lot of. Serissa are more difficult to keep than the Chinese Elm. Variegated Serissa tend to do better than the more commonly found, non-variegated variety. The species does flower, giving rise to the name “Tree Of A Thousand Stars” as it is sometimes known. Variegated Serissa seem to flower more readily than the non-variegated varieties. Serissa bonsai can be kept indoors but will benefit from spending time outside. Temperatures below eight degrees should be avoided. Suitable locations in the home are the usuals with indoor bonsai – A well lit spot but not in full sun all day. Window sills are good so long as their isnt a radiator below the window and you dont close the curtains at night as this makes the temperature fluctuate rapidly. Kitchen and bathroom windows can be very suitable for these reasons. Serissa take a little time to adapt to new locations and can drop some leaves in the process, which should grow back after a few weeks. Again, with Variegated Serissa this seems to be less of a problem. Serissa need an even level of watering. Their roots can rot of they are left waterlogged to don’t be tempted to drown them everyday. Having said that if they become bone dry you may experience yellowing and leaf loss. Get used to feeling the surface of the soil, when it feels dry its probably time to water. 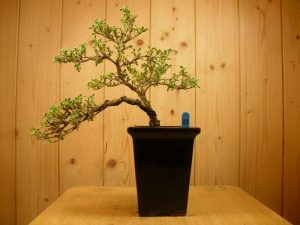 as the Serissa is a sub-tropical species, creating a humid environment, using a drip tray and gravel for example, will help the success of the bonsai. Prune new shoots back to a couple of sets of leaves in order to maintain the design of the bonsai. Serissa grow quite slowly and don’t like having their roots messed with particularly. Repotting can therefore be done every three or four years depending on the size of thbe pot. use a standard soil mix. Feed every couple of weeks using a low strength food.